Well Peter Parker is back in his own head and he couldn’t be happier to be alive. 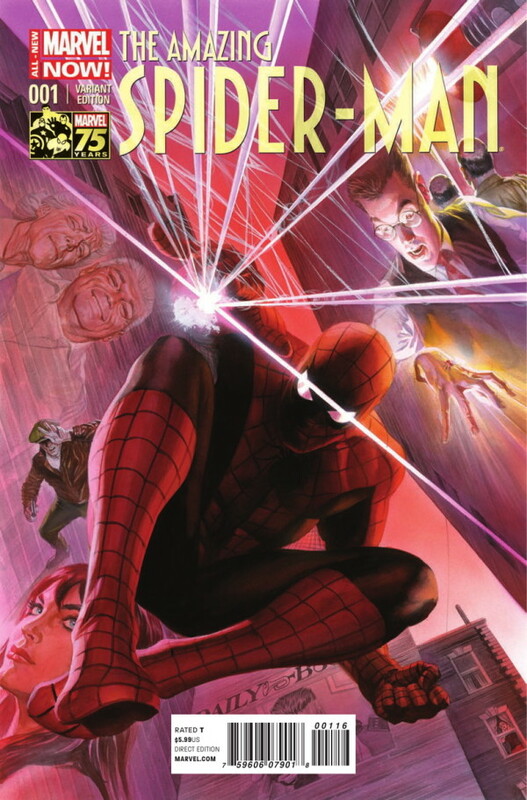 Dan Slott has the pleasure of being one of a small number to be the mastermind behind an Amazing Spider-Man #1. What can I say except from this issue is great? Well a lot actually, since I’m writing an entire post on the thing. 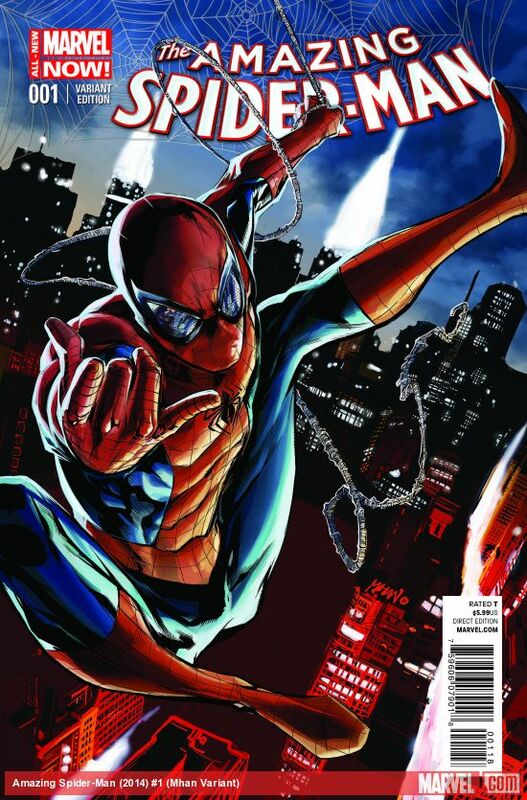 The issue opens with a retelling of the familiar origin story, Peter gets bitten by a radioactive spider as we’ve seen retold hundreds of time in hundreds of ways -comic retellings, Ultimate Spider-Man, 2 origin movies, many different cartoons, a live action tv series etc etc- but this time there’s a twist. As Peter is running dizzily out of the science demonstration it is shown that the same spider bites a young woman on the ankle. We don’t learn who this woman is or even see what she looks like but potentially there’s a woman out there with Spider powers who got them minutes after Peter did. Why haven’t we heard of this before now? Who knows but I’m sure we’ll find out. My opinion on this twist on the origin depends heavily on what they actually do with it, I’m not disinterested in it but it’ll need to be developed before I see it as a good or bad idea. Currently it is the Schrödinger’s cat of ideas. After this we catch up with Peter in the present where he’s doing what he does best, stopping crime. It seems as if he’s somehow lost his costume and is wearing a makeshift pair of underpants that he has made using his webbing. What a hilarious image and an unorthodox way to introduce present day Spider-Man in his relaunched comic book, unorthodox yet completely making sense. Peter is back on top form here, cracking wise and taking down some Z-list villains, no job is too small for Spider-Man, a thinking that Doc Ock never shared when he was in Peter’s brain. Since we’re in the middle of the action we are whisked back four hours earlier to find out how this all happened. Peter is holding a press conference to tell everyone that he’s alive and that he has severed ties with Spider-Man -that’ll be a tough lie to keep up for him so expect some drama here in the future- as well as assuring the press that it is business as usual for Parker Industries. Peter still can’t quite believe that he’s the CEO of his own company and isn’t quite sure what else Ock has done in his name, it’s probably going to take a while to figure all of this out. Not least of all is Anna Maria who lives with him and finds an engagement ring along with a letter that Ock wrote intending to propose to her. I honestly can’t think of how Peter will react to this relationship and what he will do about it, it’s going to be difficult to deal with without making him look like a terrible person. I’m interested to see how they play this one. Another thing that Peter has to deal with is billion dollar ideas that Ock has been working on. Not being a cyberneticist Peter has no idea what these designs are or what they’re supposed to do. He does toy with the idea of accessing Ock’s memories but quickly shuts that down, I don’t think anyone wants to go over that again. Peter takes the specs and decides that he should be able to figure it out. It’s also interesting to see how his employees react to him, as if they’re afraid of him. I wonder how quickly people who were close to Ock in Peter’s head will notice that Peter is acting completely differently now. Sajani is already noticing it because Peter is repeating everything she says that surprises him about his life, which is everything. 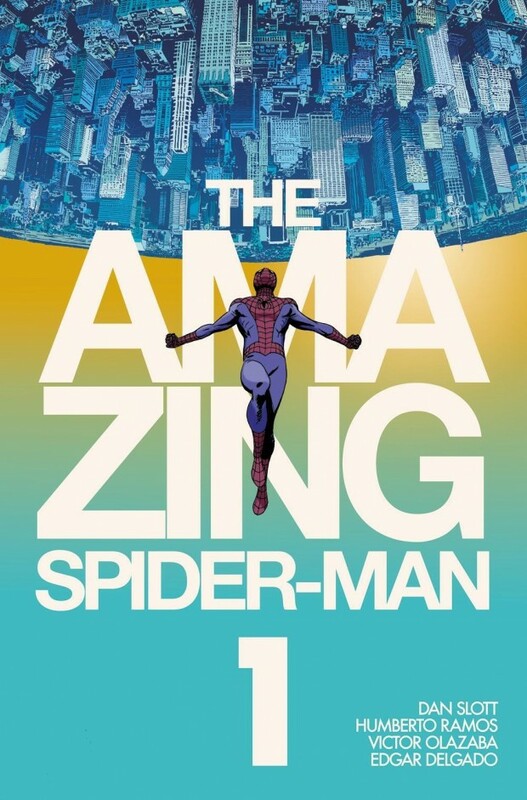 Being overwhelmed about his new life causes him to unwind the only way he knows how, taking to the streets as Spider-Man which catches us up to the beginning of this story. Seeing him lose most of his costume is absolutely hilarious and the reactions of the various characters it cuts to are absolutely priceless, even causing Captain America to crack a joke -something that is very rare. The Avengers are convinced that Peter Parker is definitely back, a story thread that could have lingered but I’m glad that it won’t. The issue ends on the complication of Anna Maria now knowing his identity due to her intimate knowledge of him. This should be an interesting conversation next issue. After this story we get a collection of shorts. 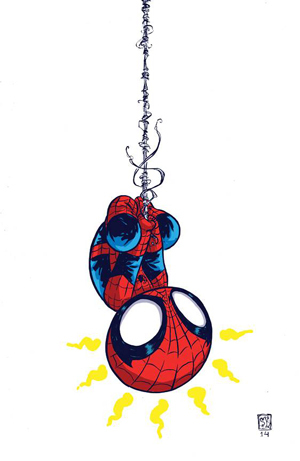 The first being Electro’s unstable power and his growing hatred for Spider-Man who he blames for doing this to him. Of course this was Ock’s doing so that’s just another thing that Peter has to deal with. The timing of using Electro is obvious considering he’s one of the villains in the just released in the US The Amazing Spider-Man 2 but it’s good that there’s been no compromise on the comic version to try and match him a little closer to the depiction in the film. The next short is Black Cat fostering her hatred for Spider-Man from inside prison. Like Electro, she blames him because it was Ock who caused her current situation. Understandably she’s angry and is out for revenge. Yet another problem for Peter to deal with. There’s a quick introduction to Spider-Man and how his world works in a crudely drawn, amusingly put together short which explains how his world and powers work and a little on who he is. It’s inventive and funny but not got much to say about it, nicely tongue in cheek and fits the character well. Spider-Man 2099 is up next in something of an advert for his own book out in July. We get a little of his frustration to being stuck in this time and how strange he finds the world. It’s good stuff and I look forward to reading it. 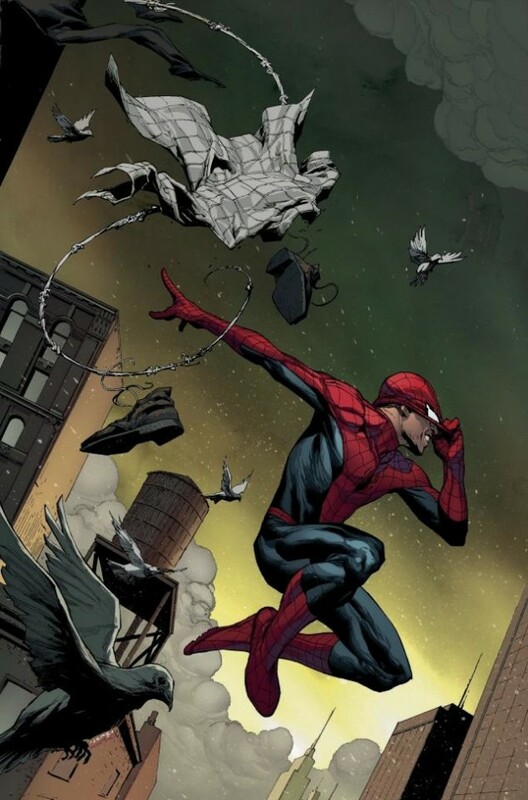 Next up we have a story where Peter goes to Houston to look for Kaine who he has heard is the hero out there, there’s a sense of pride in Peter’s words as he is impressed that Kaine managed to rise above all that went wrong in his life and protect people. There’s also genuine affection from Peter as he hopes that Kaine found peace. Something of an advert for New Warriors but a nice one so I’ll let it slide. I do miss Scarlet Spider and wish it hadn’t ended. The final story takes us back to Spidey’s early days from the perspective of a young kid who is there for Spider-Man’s first public appearance -the wrestling match where people first saw his powers- and reveals that this unnamed kid is responsible for much of Spidey’s early notoriety by uploading the video to “UTube”, it plays fast and loose with the time period since he’s using a camera phone which makes it clearly not the 60s but that’s just something that has to be done now as it’s ridiculous to think of Peter as a teenager in the 60s since he’s in his late 20s now decades later. This kid also goes to the Ed Sullivan show and is there for Spidey’s first in costume appearance, he even sees the criminal who killed Peter’s uncle Ben breaking in and tries to warn someone but fears losing his place in line but doesn’t. After the show he gets to meet Spider-Man and feels inspired by the fact that he’s clearly just a kid too. 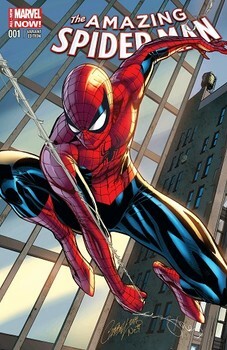 The story ends with him making a mask that’s similar to Spider-Man’s except it’s white and has no web patter. 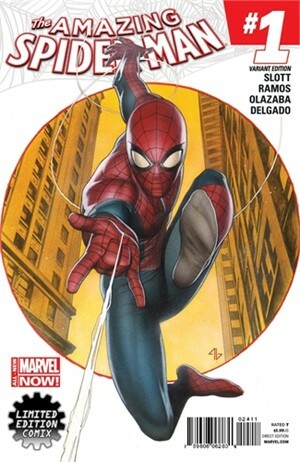 This story was interesting, it was a cool perspective on those early days and it’s clear that Dan Slott wants to set up some plotlines that range back to Spidey’s beginnings. Again, not necessarily a bad idea but I want to see how it’s all dealt with before committing to it being good or bad. Overall, what a great start. Peter Parker is on top form with his wise cracks and back luck, I also like how he reacts to everything he sees, having to learn everything about his life more or less from scratch. He’s in a different world right now and this makes it all fresh and interesting. 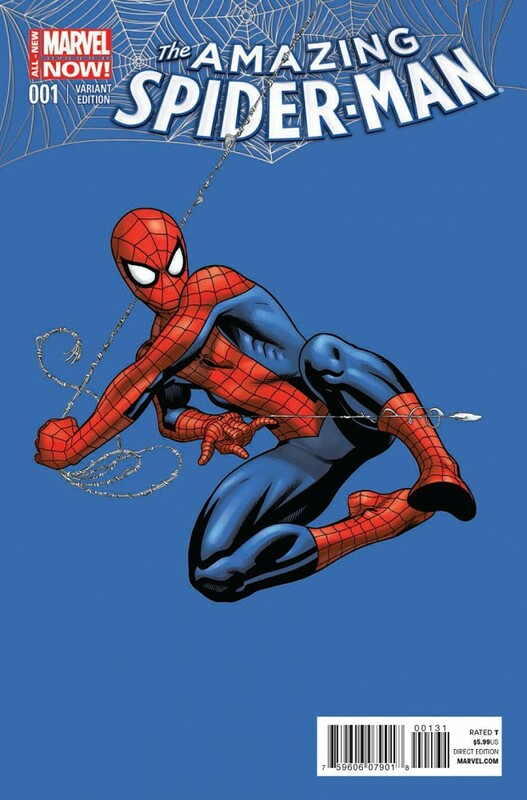 The issue does a great job of setting up stories that are going to happen very soon without bogging the issue down with them, they are quickly introduced and then it moves on, focusing on Peter being back and keeping that prominent. The shorts at the end giving us tiny glimpses of other characters and different situations are a nice touch, it helps set things up without compromising the narrative of the main story. 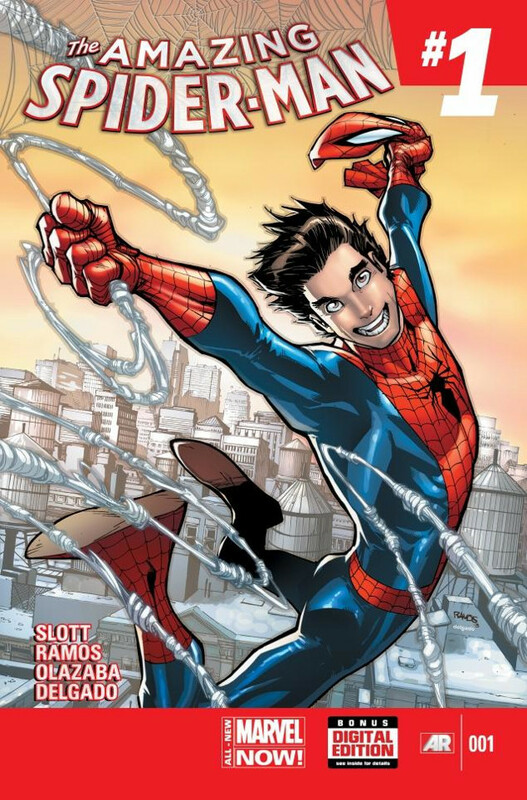 Peter’s back and I’m glad of that, Superior Spider-Man was good when it lasted but there are lots of reasons that people love Peter Parker so much and Dan Slott understands those reasons better than most which more than shows in these pages.